Mariah Friedland, a student at the University of Alabama, highlights the top five foods you cannot leave Rome without trying! Whether you are in Italy studying abroad or you are here visiting with family and friends you will most likely see the sights and experience new adventures, but there is a must in trying all of the food. I know when visiting Italy you expect a lot of Italian food, which is true, but there are still a few other choices you may choose from. Italy is known for the pastas and the wine, but it’s not your typical pasta. It is most likely handmade and served fresh everyday. If you aren’t a big fan of carbs this might not be the place for you to visit because Italians sure love their bread and pastas. 1. Panini – a must try and most likely very easy to find or close proximity to where you are staying. They serve these in small cafes or shops all around Italy in places such as Positano, Rome, and Florence. A favorite place of mine in particular would be Vini Panini located in Positano, Italy and home to the sandwich, which is actually as big as your face. 2. Pizza – every place will claim to have the BEST pizza, but only few will have the special gourmet fresh mozzarella Italian pizza you are truly looking for. Many places the pizzas come and are way too big to eat by you, so plan on sharing. If you get the chance to visit the remains of the city of Pompeii you will find yourself in a prime pizza location. Pizzeria Pompei would be the choice I highly recommend. Whether you order the Vesuvius pizza or simply the Margarita pizza you cannot go wrong with whichever you may pick. 3. Gelato – picking a good gelato place can be challenging because if you are not a gelato connoisseur they really all taste the same. 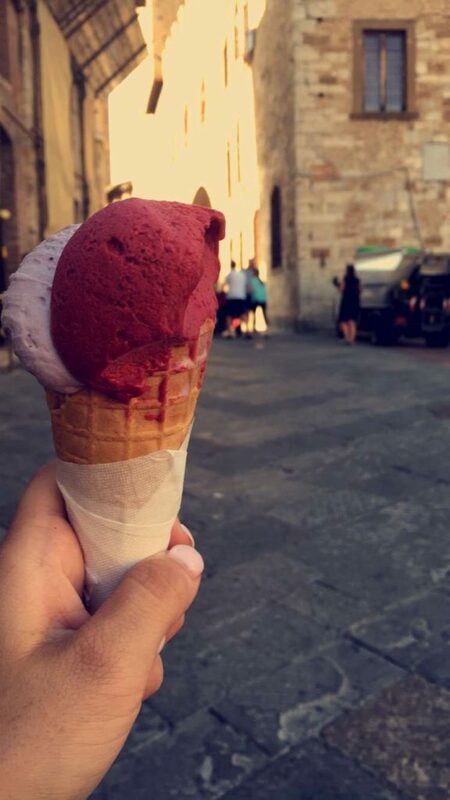 I can’t tell you the best place to get gelato however, I can tell you my favorite flavor to get. My favorite would have to be the ricotta one, I know it might seem weird and at some places it might even be called cannoli, but it is so unique and so delicious. If you have the chance to try multiple places I suggest trying as many flavors as possibly because you cant find gelato like the kind you find while visiting Italy. 4. Pasta – depending on what you prefer for pasta you really can’t go wrong in picking out a pasta entrée. Restaurants can limit options, but as far choosing from ravioli, penne, spaghetti, or rigatoni, it is simply your preference. I thought that after my fourth time eating ravioli I’d be sick of it or not have found the right one, but however I have found that each new dish of ravioli I try is better than the last. I am not able to compare completely because they are all made equally as great. 5. Bruschetta – to create perfect bruschetta is a combination of olive oil, toasted bread, served with fresh tomatoes, with Italian mozzarella cheese, and of course a little zest. All the recipes are modified because not everyone likes their bruschetta the same. Some even substitute other ingredients then the ones I listed because like I said not everyone has the same taste buds. It is definitely one of the more popular things on Italy’s restaurant menus along with the famous caprese salad, which is a favorite as well.